The Ford Mustang is all-new for 2010. Everything but the roof on the 2010 Mustang is new. And it's all good, all improved over the superb 2004-2009 version of America's pony car. We found the 2010 Mustangs quieter and more refined than the previous models. More important, the 2010 Mustang GT is an absolute blast to drive, quick off the mark with a brawny sound. The clutch pedal is light and easy to use in heavy traffic and the manual sifts smoothly. The handling is crisp, the suspension feels tight, and the brakes work better in this latest generation. The Mustang has been in continuous production for 45 straight years, and more than 9 million Mustangs have been built and sold to date. That gives the Mustang the longest production run of any single model in Ford history. 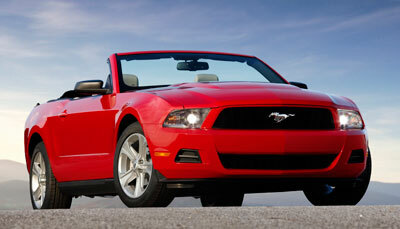 The 2010 Ford Mustang comes in three body styles: coupe, convertible, and a glass-roof coupe. Each is available in both the traditional V-6 model and the V8-powered Mustang GT. Both engines will be available with a choice of a five-speed manual or five-speed automatic transmission. The V-6 coupe and convertible feature an upgraded 4.0-liter V6 engine rated at 210 horsepower and 240 foot-pounds of torque. The V-6 model comes standard with 17-inch wheels and tires, with 18-inch wheels optional. A rear stabilizer bar now comes standard on the V-6 models, and the entire suspension system has been retuned for more performance feel. The Mustang GT gets a more powerful V8 for 2010, producing 315 horsepower and 325 foot-pounds of torque from 4.6 liters. Ford's Sync electronics, navigation with Sirius Travel Link and a rear-facing camera are among the options never before available on the Mustang. Options include the five-speed automatic transmission ($995), the glass roof option ($1995), a navigation package ($2195). A premium package ($3000) upgrades with leather six-way power driver seat with power lumbar and two-way adjustable head restraint, bright shift knob, door trim panel inserts, leather wrapped steering wheel w/aluminum spokes, six-gauge cluster w/MyColor, gloss paint center stack and console, satin door speaker surrounds, Ambient lighting, Bright aluminum accent dash appliques, pedal covers, scuff plates and shifter knob, special wheels, Shaker 500 AM/FM/6CD MP3 audio system, eight speakers, Sirius Satellite Radio, Sync communications system, and split-folding rear seats. An optional Track Package includes upgraded front brakes, a recalibrated AdvanceTrac system that allows later intervention, and the 3.73:1 axle ratio. Track Package II will include Pirelli 19-inch tires and wheels, upgraded front and rear brakes and heavier springs, shock absorbers and brakes along with recalibrated traction and yaw control systems designed for weekend racing. Ford Racing Performance Parts will offer a wide array of performance and appearance options for the new Mustang, up to and including a complete bolt-on supercharger kit. The safety package includes six air bags, tire pressure monitoring, the Ford Personal Safety System that controls the level of air bag deployment according to impact speed, and a new SOS post-crash alert system that unlocks the doors, turns on the four-way flashers and sounds the horn if an air bag is deployed. The 2010 Mustang body design is new from end to end, this time with integrated multi-element headlamps replacing the twin round lamps of past Mustangs, a power-dome hood that droops over the grille at its leading edge, completely new side sculpting, and chamfered three-element taillamps that house sequential turn signals, blinking from the inside lamp to the outside lamp to help those following understand which way you're turning (a technology first used on the 1964 Thunderbird, reprised 46 years later). Ford says the new Mustang body yields 23 percent less aerodynamic lift at the front with a new slotted panel installed under the radiator to direct air, 50 percent better in front/rear lift balance, and has seven percent less aerodynamic drag. They tell us it is 12 percent quieter in wind noise than the outgoing car, 15 percent quieter in the case of the convertible. Ford also points to a 33 percent reduction in squeak and rattle performance, and a 10 percent improvement in speech intelligibility due to interior noise reductions, especially in the convertible. The 3500-pound Mustang uses welded steel unibody construction with front and rear subframes to mount the steering and suspension systems, with almost half the body weight in high-strength low-alloy steel. Inside, we found the front bucket seats significantly more comfortable and better looking than the slabs used in the 2009 models. Altogether, the 2010 Mustang is much more refined than any previous model when it comes to noise, a much more comfortable car to be in, whether cruising or a full throttle. The 2010 Mustang has a completely new chiseled approach to interior design, with throwback instrument design complemented by softer-feeling surfaces throughout, and the use of real aluminum plates on the fascias, pedal covers, scuff plates and shifter knob. Interior ambient lighting in the door pockets, cupholders and footwells is a new interior feature, and the lighting colors can be changed through a range of 125 colors with the flip of a switch with the new MyColor system. New interior and entertainment features for Mustang include a rear-facing video camera, the Sync voice-activated hands-free system for the first time in a Mustang, featuring Sirius satellite radio and satellite navigation with Sirius Travel Link. The new leather-clad steering wheel is a massive affair with six brushed metal spokes in three groups of two, with cruise controls switches and controls for the sound system, a wheel that gives a very big feeling of command. The leather interiors are of a higher grade than ever, the console can now be locked to hide valuables. The instrument panel is made in a single piece. We found the new Mustang is much quieter than the old car, with improvements in wind noise, road noise, mirror noise and powertrain noise. The radio antenna is moved to the rear to eliminate noise, the wiper design is changed to flatter blades that don't make as much noise, the washer nozzles are inside the hood, and the mirrors are reshaped. Inside, there is more mastic, a better grade of carpeting, a sound-absorbing headliner material, and there is a lot more noise insulation in the body. Our 2010 Mustang GT test car was a GT coupe with a starting price of $27,995 and a bottom line of $34,015 with the $850 delivery charge and options thrown in, including Track Pack (19-inch summer tires and alloy wheels, 3.73:1 axle ratio, revised traction control and yaw control parameters, and upgraded suspension), security package, and comfort group. The 2010 Mustang GT carries an upgraded 4.6-liter 3-valve V8 engine rated at 315 horsepower (up from 300 on the 2009 version) and 325 foot-pounds of torque (up from 2009's 320 lb-ft). The redline has been raised 250 rpm to 6500 rpm for 2010. The engine has two built-in calibrations for regular or premium fuel (the use of premium fuel adds up to 10 foot-pounds of torque between 1000 and 3000 rpm, they tell us). The new engine gets its cold intake air from a system built into the grille, not under the hood, the lowest-restriction air intake system ever on the Mustang, with an air induction sound pipe that goes right into the cockpit to make it more pleasing to the driver at full throttle. Ford says the fresh air system alone is worth three tenths of a second in 0-60 mph acceleration improvement because the engine makes much more power with cold air. On the exhaust side, the V-8 version gets 3.5-inch exhaust pipes versus 3.0-inch pipes on the last Mustang, and the V-6 version gets 3.0-inch exhaust pipes instead of 2.5-inch pipes. The standard axle ratio is 3.31:1, with two optional ratios, 3.55:1 or 3.73:1, which automatically comes with larger brakes. The GT chassis has been upgraded and stiffened using parts and pieces from the 2009 Bullitt Mustang, which means it rides tauter, turns in quicker and has less pitch, dive and body roll than any previous Mustang, as much as 20 percent less body roll. The GT rides on 235/50R18 tires, with 245/45R19 tires optional. If the 19-inch tire and wheel option is selected, the car will automatically be built with a strut tower brace under the hood to connect the two front struts for more strength and better, more accurate handling. The new tires, whether 17-, 18-, or 19-inch, have been chosen for their much higher levels of both wet and dry grip, and Ford says the 19-inch tires can produce skidpad performance exceeding 0.9g, which is very, very good for such a low-priced car. ABS brakes, traction control and AdvanceTrac yaw control are standard on all models. For track work, both the traction control and the yaw control can be turned off (but not the ABS), and there is a Sport mode which allows higher handling limits before traction and yaw controls are called in to save the day. With all of that as prelude, the GT V-8 is an absolute blast to drive. It's very quick off the mark, the manual shifter shifts more cleanly, and the engine sound is always brawny and throaty and beautiful, from its lumpy idle to redline at 6500 rpm. The clutch pedal is light and easy to use, even crawling through rush hour L.A. traffic on Sunset Boulevard. In the canyons north of L.A., the Mustang showed off more new moves than the entire cast of Dancing With The Stars, extremely quick to transition from left to right and back again with a minimum of body roll, dive and pitch in the suspension. Likewise, the brakes have much less slop in the pedal, work faster and work harder than the brakes on the outgoing model, very reassuring once you find out just how quick and how fast this new Mustang really is. The 2010 Ford Mustang is at the front of the pack when it comes to performance-per-dollar. The Mustang V-6 handles almost as well as the 2009 Bullitt model, which is saying something. The GT is quicker, faster, quieter and more refined than any V8 Mustang ever. It may not have the 425 horsepower of the new Chevy Camaro or the Dodge Challenger SRT-8, but it's also not as chunky nor as expensive. The new Mustang has more features, more comfort, and more sheer performance than any previous production Mustang, and it's priced to sell. Jim McCraw filed this NewCarTestDrive.com report from Los Angeles after driving the Mustang GT. Head/hip/leg room, f: 38.5/55.3/42.4 in. Head/hip/leg room, r: 34.7/51.6/29.8 in.